Australia has the unique distinction of having had the first regularly formed signal unit in the British Empire. In 1869 there existed, in New South Wales and Victoria small "torpedo and signals corp". These continued until 1882, when they were disbanded. In 1885 a "signalling corps", composed of 1 officer and 12 other ranks, existed in South Australia and remained active until 1901. Before the advent of self-contained signals units, the complement of signallers was on a regimental basis, each unit having on its establishment a proportion of regimental signallers. Great attention was paid to the training of these personnel; prizes and badges being awarded to those qualifying at what was known as a "signalling school". Instruction was imparted by a staff officer designated "Inspector of Signalling". After the inception of the Commonwealth Forces, an "Australian Corps of Signallers" was formed on 12th January, 1906. This Corps remained as a self contained unit, until the introduction of universal training in 1911, when it was merged with Australian Engineers. In 1912, signals troops and companies formed portion of the Corps of Australian Engineers and served as such throughtout World War 1. These units had such names as "15th Engr Sig Tp (Engrs)" and "23rd Engr Sig Coy (Engrs)". These designations were retained until 1916, when the term (AE) was substituted for (Engrs) in the title. With the introduction of the divisional organisation in 1921, the terms "Cav Div Sigs" and "Div Sigs" appeared for the first time. Coinciding with this change of nomenclature, all Signals units were separated from the Australian Corps of Engineers. 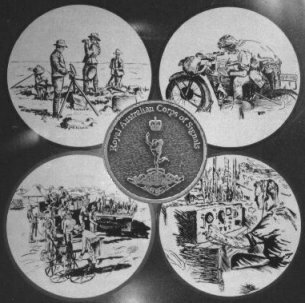 On the 1st January 1925, the Australian Corps of Signals was formed. Thus began the evolution of the Australian Corps of Signals which reached a total strength of 24,000 men during the Second World War. On 10th November 1948, His Majesty King George VI conferred the title "Royal" on the Australian Corps of Signals. Since then, members of the Corps have served with distinction in all operational areas in which Australian troops have been involved - Korea, Malaya, Borneo, South Vietnam, Cambodia, Timor and the Middle East. The Corps now has a regular peacetime strength of some 300 Officers and 2,300 Other Ranks. Its members are to be found in many parts of the world and in all States of Australia. On the 10th November 1948, His Majesty King George VI conferred the title "Royal" on the Australian Corps of Signals. The day is recognised a "Corps Day", and commemorative functions are held as near as possible to 10th November each year. The present Corps Badge, approved in 1946, is described as: "The figure of Mercury on a globe, the latter supported above by a scroll bearing the motto 'Certa Cito', and a boomerang below bearing the inscription 'Australia'. The whole is surmounted by a crown, detached. Mercury and the globe are in sliver; the remainder gilt. Mercury faces his right." The Corps motto is 'Certa Cito' and is translated as 'Swift and Sure', signifying the aim of the signal service - that communications be carried out with maximum speed and certainly. Tactical (White over Blue) - White symbolises the ribbons wound on the Caduceus of the God Hermes and the Blue representing the Royal Colours. Domestic (Light Blue over Dark Blue over Dark Green) - Representing the three media of communications, the air, the sea and the land.